Natural stone flooring is an elegant option that looks nice in bathrooms, kitchens, hallways, and other rooms throughout your Lakeland, FL home. Natural stone flooring is an elegant option that looks nice in bathrooms, kitchens, hallways, and other rooms throughout your home. When the natural light coming through the windows catches the colors and patterns of natural stone flooring, it really stands out. Since stone is naturally created throughout the world, each piece will look slightly different, and that unique component will make your floor truly one-of-a-kind. When you choose your stone, make sure to look at several samples, just in case the piece you fall in love with is slightly different than others. One great benefit of this type of flooring is that it naturally resists mold and other bacteria growth. When you live in a humid climate, like we have here in Lakeland, Florida, this is very appealing. 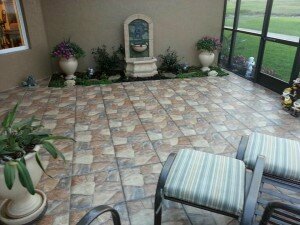 Other advantages include a timeless and classic look that won’t make your home feel outdated, even 30 years after installation, as well as durability. It is easy to refinish a scratched natural stone surface, so with a little extra TLC, you can keep your floor looking brand new. When our team of flooring experts at Jim’s Floor Depot installs your new floor, we will also cover it with a clear sealant. This protects it from stains and spills, which is especially important for natural stone flooring because if left untreated, it can absorb oils or acidic material that may drip when you are cooking. This style of flooring is a great addition to your home, increasing the value and adding an overall nicer appearance to the room.